One of the most precious pieces of Portugal's patrimony is the Sudoeste Alentejano and Costa Vicentina, a majestic sweep of coastline and hinterland that stretches from S. Torpes near Sines in the north to the border of the Algarve at Odeceixe to Sagres and the rural district of Vila do Bispo in the south west. Declared a protected zone by the Government in 1995, it is a place of wild, rugged landscape where nature combines with history to create a unique and often awe-inspiring environment. Its existence as the nation's largest protected coastal zone ironically owes itself to the fact that at the onset of mass tourism in the Algarve in the 1960s developers considered the region too desolate for touristic development so it was spared the high rise buildings and resorts that characterize much of the southern coastline. Today, its untouched beauty and cultural traditions have been finally recognised and preserved for future posterity and it is being increasingly promoted as an area of special ecological importance and a wonderful haven for tourists who like to explore off the beaten track. The park embraces an area of about 75.000 hectares and comprises a vast strip some 2kms wide running parallel to the coast, the mountainous terrain of Serra do Espinhaço and Serra de Monchique, and the western interior region. Sparsely populated ( around 27,000 inhabitants live and work within its boundaries) it is rich in flora and fauna and marine life as well as traditional maritime activities along a coastline dotted with some of Portugal's most beautiful unspoiled beaches. Some are sandy coves hidden at the foot of cliffs, others are broad expanses of sand that stretch to the horizon. Some are difficult to find but once discovered offer wonderful peace and solitude. Many are exposed to the Atlantic rollers so excellent for surf-boarding. The park contains no fewer than 750 species of flora, 12 of which, in the Sagres area, are unique in the world, and at least three flowers are named after the Cape St Vincent (Scilla vicentina, Centaurea vicentina and Biscutella vicentina). The west coast is also one of Europe's most important habitats for sea and land birds migrating to and from Africa and more than 200 species are recorded, some of them very rare. They include the magnificent Osprey (Pandion haelitus) once a threatened species in this region but now breeding in small numbers thanks to the wild untouched rocky space. The odd pair of Peregrine Falcons may also be seen along with Bonelli's Eagle (Hieraaetus fasciatus). The most characteristic land birds are Buzzards (Buteo buteo), Kestrels (Falco tinnunculus), Barn Owls (Tyto alba), Blue Rock Thrushes (Monticola solitarius), Rock Doves (Columba livia), Jackdaws (Corvus monedula) and Black Redstarts (Phoenicurus ochruros). Choughs (Pyrrhocorax pyrrhocorax) congregate in winter and you may catch sight of its larger cousin the Raven (Corvus corax), which has legendary associations with the Cape. Cape St Vincent takes its name from the Iberian martyr St. Vincent whose body was washed ashore at the Sacred Promontory (Promontorium Sacrum) and then guarded in a local church - Igreja dos Corvos, by 10 sacred Ravens. In later years Vincent's remains were exhumed and taken by ship for re-burial in Lisbon as a protection from desecration by the Muslims. Legend tells that the Ravens kept constant vigil from the rigging of the ship during the voyage. The Raven has consequently been part of the insignia of both the City of Lisbon and the Vila do Bispo municipal authority. 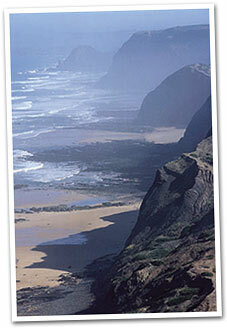 The headlands around Sagres and Cape St. Vincent are an ideal vantage point to observe the sea bird life. You don't need to be an expert ornithologist to appreciate the sight of such birds as Gannets making its slanting or torpedo dive into the water with black-tipped wings angled back to catch fish. Sagres, with its imposing 15th century fortress on the promontory, is linked with the epic Portuguese voyages of discovery and to sit quietly on the cliff-tops and cast your eye around the 15kms amphitheatre of sea and cliffs to the Cape invokes a powerful sensation of the tremendous historical importance of this place and the extraordinary mariners who passed this way, among them Prince Henry the Navigator. Evidence of the early school of navigation can be seen in a large circular sun-dial, the foundations of which date from the 15th century to 16th century and the 16th century church of Nossa Senhora da Graça (Our Lady of Grace) is where Prince Henry and countless other mariners prayed before setting out on their epic voyages into the unknown. The fortress at Beliche near Cape St Vincent was built in the 18th century on older foundations and is visited by more than 300,000 tourists each year. The ocean views from here and the nearby lighthouse are spectacular and it is interesting to note that the 1000 watt lamps in the lighthouse tower are capable of throwing a four metre tall beam 60kms out to sea, the second most powerful in Europe. The mythical atmosphere that shrouds Sagres and Cape St. Vincent is chronicled by Greek authors in the 4th century who stated that it was forbidden to go there after dark because at night it was inhabited by the Gods. For the Romans the whole area was part of the Promontorium Sacrum ( Sacred Promontory) from which the name of Sagres derives, the most westerly part of the known world where the setting sun made the waters of the ocean boil. Much of this historical importance can now be seen in a museum inside the fortress walls dedicated to the maritime explorations. The museum contains an excellent multi media auditorium as well as a well-stocked book shop and there is a nearby gift and souvenir shop. The Fortaleza will also be a base from which guided tours to explore the flora and fauna and the culture of the vicinity are planned to start this year. Dr. Rui Parreira Director of the Fortaleza, said: " This is not only a place of architectonic heritage but a monument where architecture and nature come together and geographically it is unique. It is also a place of memory with a strong aura of mystery. This region has a very special profile and what we want to do is to make this an anchor point to rediscover the region's natural heritage and culture. The itineraries have already been prepared and we hope to start the tours this year." Running north from Cape St. Vincent is a virtually untouched wonderland where endless tracks criss-cross and meander through deserted pine-forested hills, dramatic clifftops and picture-postcard villages and hamlets. Along this coastline, as well as inland, you are likely to see a fascinating range of animals in their natural habitat - the Wild Boar (Sus scrofa), the Genet (Genetta genetta), the European Wildcat (Felis silvestris), the Badger (Meles meles), the Otter (Lutra lutra), the Egyptian Mongoose (Herpestes ichneumon), the Iberian Lynx (Lynx pardinus) and the Fox (Vulpes vulpes). Typical of the stunning landscape is the Torre de Aspa, signposted on the back road from Vila do Bispo to the beaches of Castelejo and Cordoama. A restored coastguard's watchtower house is perched on a clifftop 150 metres above the sea offering truly breath-taking views to Cape St. Vincent to the south and along more than 10 kms of the unspoiled beaches of Castelejo, Cordoama, Barriga, Mouranitos, Miroçou and Murração that stretch north to Carrapateira and beyond. The population of the park is distributed across 11 urban districts and the principal economy is from fishing, intensive farming and tourism. The whole of the west coast is a huge fishing ground. Every rock and cove seems to attract its own fishermen, often perched dangerously high in cliff crannies. The regional cuisine, not surprisingly, is memorable for its seafood including wonderful fresh fish and shellfish, black shelled mussels and Goose barnacles, a regional delicacy which is torn from the rocks, often in perilous conditions, with a tool known as an "arrilhada" originally used for tilling the land. Often the gathering of shellfish is carried out by the whole family. Inland, cork, papier maché and wood are a source of income while the fruit of the arbutus tree is used for the distillation of the regional firewater known as 'medronho'. The inland region is also known for the growing of sweet potatoes. The pottery studio Olaria dos Almarguinhos which combines new techniques with traditional icons is well worth visiting while the traditional craft of spinning wool and knitting is to be seen in many corners of the villages and towns. A guide entitled "Discovering Menhirs" is available from regional tourist offices. It focuses on the Monte dos Amantes area, which translated means Hill of Lovers, the name probably originating from the mythical Mandrake plant (Mandragora autumnalis) that flowers in the valley between November and December and is said to have been used to concoct love potions. Medieval writings claim that the Mandrake also had pain-killing and sleep-inducing qualities and when pulled from the earth it screamed, the sound causing insanity in the unsuspecting picker. There are a number of historical monuments worth visiting in the Vila do Bispo area. The town's beautiful 18th century church is notable for its classic blue and white hand-painted tiles (azulejos) fresco paintings and gold-leafed altar and nave vaults. The village of Raposeira, a few kilometers to the east, is believed to be one of the places where Prince Henry the Navigator lived and he is said to have prayed in the tiny 13th century chapel of Nossa Senhora da Guadalupe which has interesting Romanic Carvings and Gothic windows. Also worth visiting in other regions of the park are the archaelogical sites of Pedra do Patacho and Palheiros do Alegra, the ruins in Boca do Rio, the Forte de Almadena and the Bateria do Burgau. The ancient settlement of Aljezur is famous for its 10th century Moorish castle and was the last Arab stronghold to be conquered by the Portuguese in the 13th century conquest of the Moors. The town is full of charm. Apart from the castle ruins there are a number of places of interest including the Municipal Museum (Museu Municipal), which contains works of art, archaeological artifacts and a collection of artesans' tools and farm implements. The Museum St Anthony (Museu Antoniano) is a 17th century building dedicated to the Saint Anthony of Lisbon. The house and garden of the Aljezur-born painter José Cercas in Rua do Castelo is now a museum containing a collection of his work, mainly portraits, landscapes and flowers, and some fine antique furniture, porcelain and other artists' work that he collected during his lifetime. The Igreja da Misericordia in the centre of the town was built in the 16th century and next door is a museum of religious art (Museu de Arte Sacra) which opened last year. Coastal fortresses built around the Medieval period can be seen at the Ilha do Pessegueiro, a small island situated 250 metres offshore and an important navigation point in Roman times, Vila Nova de Milfontes, Aljezur, Odemira and Odeceixe, being the latter three important interior ports served by freshwater rivers. still remain, but in Carrapateira the first inhabitants fought Arabs and corsairs that entered the port to steal food and capture slaves to serve in Morrocco. So, in 1673, a fort was built on the site of an ancient temple. At Carrapateira you can see the fort and also drive along a cliff-top track that winds from the village to the Amado Beach with stupendous views of the coastline and cliffs and the ocean. Along this route you will also see the mounds of deep violet and sienna seaweed (algas) which is gathered by the local people and sold for the production of medical remedies. This traditional activity is carried out in the areas of Bordeira, Azenha do Mar and Odemira. A brief text in a brochure for this region spells out the poignancy of environmental conservation: "We hope to give all those who visit us the chance to know our homeland, the nature which surrounds us and of which we are part of, the heritage and inheritance of our ancestors. The traditions, source of our cultural identity, the gastronomy, based on what the sea and the land gives for our toil, the legends and the history - one born in the imagination of our people, the other in the traces of our predecessors. Finally, the unique landscape, carefully preserved, species in harmony with each other in a refuge where the beauty of life will survive."